Police are hunting a pair of suspects in the separate thefts of high-fashion sunglasses the same day at Westfield Geelong. Police this week released images of a female and a male wanted for questioning over the alleged thefts, hours apart last Friday. 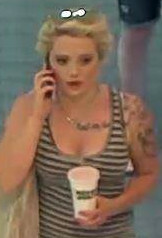 An “unknown female offender” allegedly stole a pair of Bvlgari sunglasses worth $520 around 2.30pm. The women in the surveillance camera image “maybe able to provide some information” about the theft, police said. The images showed her in a white-and-black-stripped dress with a handbag over a shoulder and tattos on her upper left arm and chest. The unknown male might hold “valuable information” about the earlier theft, at 9.50am. Police alleged the suspect thief entered a Westfield shop, “selected” a pair of Prada sunglasses worth $350, then “left the store without making any attempt to pay”, police said. Police urged anyone with information about either incident to phone Crime Stoppers on 1800 333 000, quoting incident number 180096344 for the alleged theft involving the woman or 21709136 for the incident with the male.